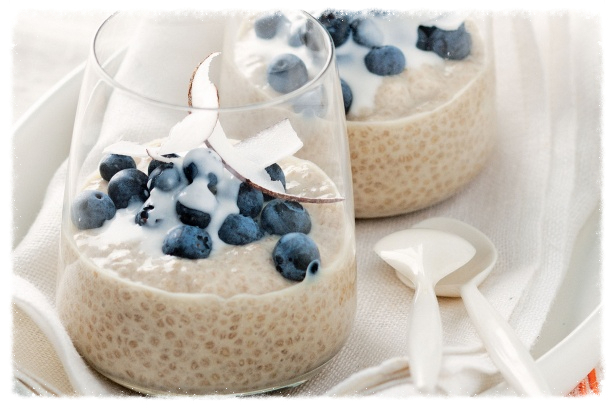 In a bowl combine almond milk, chia seeds, vanilla, THE SUPER ELIXIR™, honey and mix well. Allow to sit for a few hours or overnight until seeds have absorbed most of the liquid and the mixture is thickened in consistency. Spoon into a bowl or glasses and garnish with shaved coconut and blueberries. Don’t be fooled by the size… chia seeds pack a powerful nutritional punch! Chia seeds are among the most nutritious foods on the planet. They are loaded with fiber, protein, Omega-3 fatty acids and various micronutrients. A 1 ounce (28 grams) serving of chia seeds contains: Fiber: 11 grams, Protein: 4 grams, Fat: 9 grams (5 of which are Omega-3s), Calcium: 18% of the RDA, Manganese: 30% of the RDA, Magnesium: 30% of the RDA, Phosphorus: 27% of the RDA. They also contain a decent amount of Zinc, Vitamin B3 (Niacin), Potassium, Vitamin B1 (Thiamine) and Vitamin B2. Also, coconut water is great for hydration but you can also use filtered water or almond milk. And of course your daily dose of THE SUPER ELIXIR™ with over 40 specialised ingredients to feed your cells from the inside!